Buy Tomie 's Autographed Books! You see, clouds are fun, silly, and very interesting. 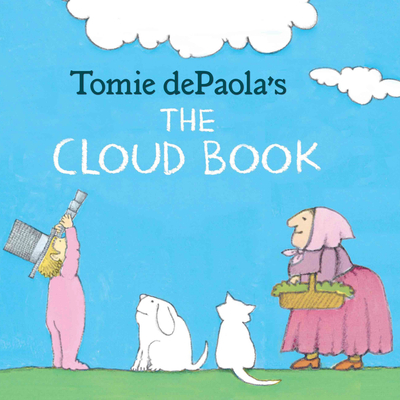 Tomie dePaola—best-selling author of Strega Nona, Quiet, and many others—knows a lot about clouds. He also knows a lot about what people think of them. Some people see animals and pictures in clouds. The ancient Greeks believed that Hermes, the messenger of the gods, once stole the sun's cattle, which were clouds. In this unique picture book, Tomie introduces some of the most common types of clouds, as well as the myths and legends inspired by their shapes. Simple, whimsical illustrations show the variations in shape and color that herald changes in the weather. This book will tell you many things about clouds we bet you didn't know. Filled with his signature humor and gentle illustrations, Tomie dePaola's approach to nonfiction is like no other. Tomie dePaola is the beloved Caldecott Honor- and Newbery Honor-winning author and/or illustrator of close to 250 books, including Strega Nona and Quiet. Tomie was born in Connecticut and grew up there with his parents, brother, and two sisters. He loved reading and books from an early age and knew, when he was four, that he wanted to write and illustrate stories when he grew up. Tomie is the recipient of numerous awards and honors, including the Laura Ingalls Wilder Award from the American Library Association for his "substantial and lasting contribution to literature for children," the Smithson Medal from the Smithsonian Institution, the Regina Medal from the Catholic Library Association, and the Kerlan Award from the University of Minnesota for his "singular attainment in children’s literature." He was nominated for the Hans Christian Andersen Award in illustration and has received the New Hampshire’s Governor’s Arts Award of Living Treasure.